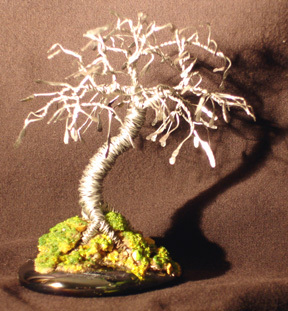 Wire Bonsai Tree SculptureHammered Leaves Mini Tree - 4" x 4" x 4"
Hammered Leaves Mini Tree - 4" x 4" x 4"
Made of 26 gauge galvanized steel wire. All the leaves of the tree are created by hammering and flattening the end of each wire. Mounted on a piece of free formed solid glass using sea sand and a bonding agent. The sand and small pebbles are painted with India ink to look like moss covered earth.